1. Toys and gadgets in vibrant colors and forms, a unique addition for both children and adults. 2. Prints including photo albums, notepads, coffee cups, postcards, greeting cards and more. 3. Home décor and objects ranging from accessories, coasters, vases, glasses and bowls, to furniture, mirrors, and cushions. Trays, picture frames, and candle holders are available as small additions to any home that requires a touch of design and refinement. 4. Fragrances in the form of scented candles, incense sticks, soaps and sprays are found in different textures and packages guaranteed to add a rich aroma to any setting. 5. Lighting, in the form of decorative lanterns and lamps woven in textile, metals, or glass. Cities Design, Art & Lifestyle is a unique concept store which houses creative lifestyle, luxury, and modern design products all under the same roof. 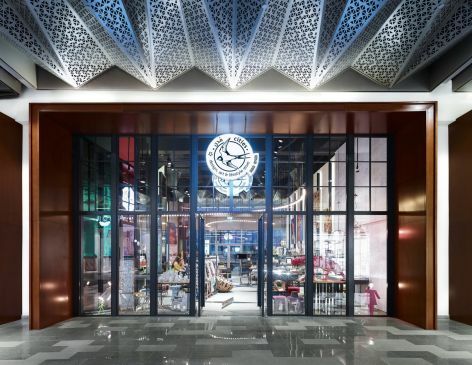 The first Cities store was launched in 2008 in Riyadh, KSA, with the goal of introducing contemporary art and design, while setting up the trend to move beyond the classical movement which prevailed in Saudi Arabia. As one of the very first stores in Riyadh to offer such eclectic and exceptional design and art collections, Cities was influential in encouraging new trends and styles in the region in the sector of design and home décor. After successfully building a solid reputation in its first location as a recognized art and design destination, Cities opened a second location in Dubai, UAE in 2014, followed by a third store, also in Dubai, which opened in February 2016. Today, Cities is an established and recognizable source for unique design and distinctive art and home accessories. Artisans and renowned designers from across the globe choose Cities as an arena to share their authentic creations. Moreover, in an attempt to promote the often neglected talents of designers from the Middle East and Gulf regions, Cities works hand-in-hand with many up-and-coming designers to highlight their contributions to the field of art and design. The name Cities was chosen to represent our desire to present a selection of items from Cities all around the world. The main idea behind the store is very simple: allow the client to travel the world, all in one space. This concept is highlighted in the logo of Cities which depicts a stamp-like image of a bird in flight. To establish this goal, Cities’ showroom and displays are ever-changing throughout the year with the hope of offering each visitor the experience of getting to know the world through the store. For this reason, people of different ages and interests flock to Cities. Upon entering, visitors are engulfed in a realm of color and form; a fusion between traditional and modern. Every addition to the Cities’ collection is hand-picked and selected from various Middle Eastern and international design shows and exhibitions, rendering each displayed item precious and distinctive. Nevertheless, exhibitions are not the sole channel by which Cities selects its products and items. Many pieces are individually selected due to personal interest or appreciation, which further validates the eclecticism that is found within the store. This particular facet of the store sets Cities apart from design stores which harbor mass marketed objects, highlighting its carefully selected items and collections. In addition to providing design products that range from toys and gadgets to fragrances, art, furniture and more, Cities offers a refreshing experience that makes a visit to the store an enjoyable and colorful source of inspiration. With such a varied inventory, and continual additions to our display, Cities maintains the ability to make diverse items available, while suggesting possible methods to incorporate these unique pieces into an existing space. In addition, our highly trained staff is always available to make suggestions or offer information about the items on display. Rather than target a single category of visitors, Cities offers a distinctive shopping experience that can be appreciated by people from all walks of life. From big brands known for their innovative, cutting-edge design such as Nada Debs, Tom Dixon, Bokja and many more, to inspirational brands such as PolArt, Alma de Luce and Images d’Orient, among others, Cities truly has something for everyone. For the discerning collector who is searching for exquisite modern furniture and art pieces, to the more casual buyer who has an eye for beautiful and original objects and for the child who marvels at a colorfully designed toy or gadget, Cities’ products meet every interest. In addition to our diverse selection of home products, Cities continues to expand our offerings with new creations and our latest development also includes the introduction of stylish design accessories and high end women’s fashions at our newest Dubai store. This addition of high quality prêt-à-porter items from up-and-coming Italian designers at affordable prices is expected to fill a need in the market as we enhance the Cities’ concept and include personal apparel. Cities, as a concept and as a store itself, also exists as an educational tool to inspire people in the realm of art and design. Our philosophy in establishing the store was to promote a more modern and eclectic style to people and help them express their individuality and identity through the art and design they choose for their homes. Our aim is also to encourage customers to look beyond the ordinary and learn more about the design and art being created in the world. With this goal in mind, Cities focuses on bringing designs that are of high quality, and meet our strict standards of craftsmanship while remaining innovative and unique. Cities is not interested in items merely because they are trendy or popular, instead we want to offer creations that are expressive and intriguing. We hope that our selection will inspire our customers to feel a connection to the pieces on display as they enjoy a variety of items that they feel are truly reflective of their personal style and interests. With locations in Riyadh and Dubai, and plans for further expansion, Cities hopes to become an integral part of the art and design atmosphere in the region. We currently offer exhibitions of artists and designers within our stores and host bimonthly events to provide exposure to up-and-coming talents from all sectors in the world of creation. Cities plans to continue in our efforts to promote the world of design and further enhance your shopping experience in our aim to become an all-inclusive, one-stop, appreciation of the Lifestyle Concept Store.